From the moment the Canadian PM landed in New Delhi to his latest trip to Gujarat, Justin Trudeau has faced a series of snubs from Modi govt. Canadian Prime Minister Justin Trudeau, who is in India on a week-long trip, has faced a series of snubs from the Narendra Modi government. Many consider Trudeau’s perceived support to Khalistani sympathisers in Canada to be the reason for this treatment. Here’s a list of all the things Trudeau has done since landing in India. Trudeau along with his wife Sophie and three children land at the Delhi airport and were greeted by the minister of state for agriculture Gajendra Singh Shekhawat and Indian ambassador to Canada Vikas Swarup. Many consider this a cold-shoulder treatment by the Indian government and have criticised the move, pointing out how Prime Minister Narendra Modi has personally gone to receive other heads of states at the airport like Israel’s PM Netanyahu, then US President Barack Obama, and UAE crown prince Sheikh Mohammed bin Zayed Al Nahyan. There was no tweet from Narendra Modi welcoming Trudeau either. On the same day, Modi had met Iranian President Hassan Rouhani and inaugurated the fourth container terminal at Jawaharlal Nehru Port Trust, Mumbai. Justin Trudeau and his family visit the Taj Mahal in Agra. “For me to be able to be here on an official trip while bringing my kids with me to share this is really special,” Trudeau said after his visit to the monument. The monument was out of bounds for the public from 9.40 am and 11.40 am for Trudeau’s visit. Even Uttar Pradesh chief minister Yogi Adityanath did not show up, let alone accompany the Canadian PM to the Taj. However, during Israeli PM Netanyahu’s 15 January visit to the Taj, Adityanath had received the PM and his wife and shown them around as well as hosted a lunch for them. Trudeau and his family visited Wildlife S.O.S, a wildlife sanctuary, and saw rescued elephants at their Mathura centre. “What an incredible place, with wonderful people doing great things for elephants and for India,” said Trudeau, who with his children also fed some of the elephants. District magistrate S.R. Mishra and the police chief were present to welcome the 46-year-old PM and his family to Mathura. Canadian High Commissioner to India Nadir Patel hosts a dinner for Trudeau and Canadian ministers — Harjit Sajjan, Amarjeet Sohi, Navdeep Bains and Bardish Chagger — who have accompanied him on this trip. 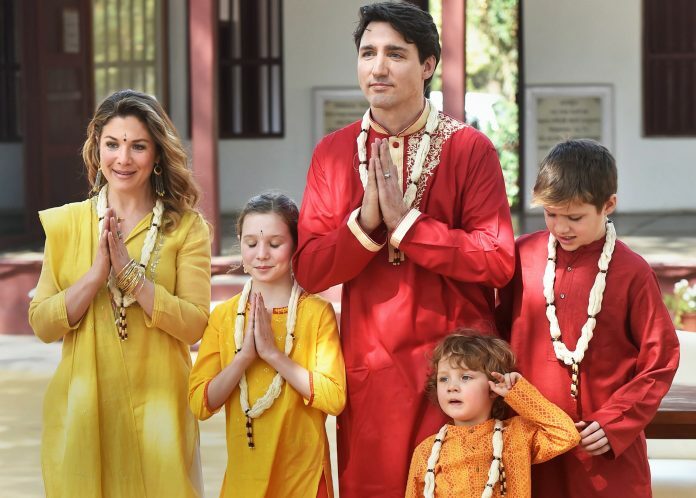 Justin Trudeau and his family arrive in Gujarat. Though the roads were decorated with billboards of Modi welcoming Trudeau to Gujarat, the Indian PM and chief minister Vijay Rupani were conspicuous by their absence. This was unusual as Modi has accompanied foreign dignitaries on trips to Gujarat such as Japanese PM Shinzo Abe and Israeli PM Netanyahu. The Trudeaus visited Gandhi’s ashram, greeting the crowd with “Namaste”. The family tried their hand at spinning cotton on a wheel and wrote, “A beautiful place of peace, humility and truth, that is as needed today as it ever was,” in the visitor’s book. The Canadian family took a trip to Akshardham Temple and met religious leaders and paid homage to Swaminarayan. Trudeau is scheduled to meet Punjab chief minister Amarinder Singh and visit the Golden Temple on 21 February, though there is uncertainty about the meet. Now all eyes are on the 23 February bilateral meet between Justin Trudeau and Narendra Modi. With inputs from Vinita Tiwari. Suresh obviously doesn’t live in Canada or what Justin has done to Canadians. omg. Please forgive me. I voted for this peoplekind. He sure fooled me with his superb acting. I am so sorry. The Indian PM is a wise man indeed to ignore this monster. Trudope has bankrupted Canada and destroyed its national values and heritage through his international donations and immigration policies. The beautiful, peaceful country that was Canada will never be the same. why invite him if you do want to make him feel wanted. He is a typical political liar and con artist…no wonder most Canadians don’t like him as he is playeing a dangerous race card to try to be popular. Being popular and being successful always don’t go hand in hand!!! He is weak…..
All eyes need to be on this traitor at all times. I understand Agha Khan and geo Soros arrive in the same area as of Feb 20. The question is, What are they up to? Can’t be good for India or Canada. We Indians are ages behind the mindset of Canadian PM. Our PM has come to this world right from the Vedas and Purana where he learnt the art of flying Pushpaks and is now dragging Indian voters to the skies with promised flight to the Heaven. Canadians are not represented by this PM. He has failed miserably and intentionally broken every campaign promise. He is a globalist traitor to his own people and country and a great actor when he needs to be. This is reflective of how closely knit the world is today. Is it not a political harakiri in foreign relations how skewed and divisive politics being practiced locally influencing international relations? Canada should have been able to foresee it, given the practice of skewed divisive vote-bank politics. Greatest young leader and statesman. A true human being who believes in simplicity and behaves like a equal citizen to its people. Will some of the mature and senior (by age) politicians learn from this young leader who believes in citizens first. I have seen his photographs walking on Washington streets with one of the child in his arms. Global leaders have lot more to learn from his simplicity to behave like common citizens. I would love to see India keep him. He is ruining our once True North strong and free. Ha ha no thanks we already have plenty of them here . What a joke your comment is. Trudeau is a narcissist who cares about himself, not the average citizen. He couldn’t care less what the citizens think or want. Trudeau cares about Trudeau, and only Trudeau. Our country has never been so unstable and divided as it is under this egotistical maniac. It will take decades to undo the damage he has done to Canada. Photo ops won’t change that fact. He is an ego trip in motion. Even with at least 75% of Canadians against him, he continues to act like Canada he is some kind of prophet. Any sensible person should by now realize what this fool is causing the country a lot of money and respect from other countries because he is trying to make us an Islam state. I follow Canadian politics quite closely and he has said little about Canadians and what he will do for our country. Here is a Muslim extremest…Justin Trudeau. From this comment I can see that you have not even heard of Prime Minister Justin Trudeau until you read this very article. How much did he promise to pay you for writing this huge lie? He is a well practiced actor and governs Canada as if he is above the law and above the wishes and voice of Canadians. He will use any tactic, including his children to draw attention and make false statements of where his loyalty lies. He refuses to deal with any respect and integrity in our house of government, refusing to answer questions set before him. When he does answer, he answers with lies or comments not relevant. He is an evil man working with the other Globalists to destroy Canada and Canadians, bring us to our knees and under the control of The New World Order. He has little to no respect from the Canadian people, he works against us, not for us and he will be gone in 2019!!! We will then elect a true Canadian who is proud of Canada and wants to see Canada prosper, not fail. Justine Trudeau is the worst PM and the worst thing that has ever happened to Canada and few to none will miss him. Washington is in the United States so you may be confusing who this ‘man’ is. Global leaders have no place in democratic free countries, and Justin Trudeau behaves anything like the common citizens when he is in Canada. He is a rude, crude, arrogant, ignorant, spoiled, untruthful, evil, immature, narcissistic, intolerant, unstable human being. May he soon be out of the government of Canada…………….. he does not speak for Canadians, he dictates to them. @ Suresh Chandra Sharma some Dr you are. Your comment shows how naive you are and ignorant about the personw whom you so effusively praise. The very same guy who has invited in Jihadis by the hundreds into Canada. He is just to femnisised lacks the quality of good leader…..
How much did you get paid by JUDAS JUSTINE, and the LIBERALS, and maybe even the MUSLIM BROTHERHOOD. You must not be Canadian, ask those who he has taxed to the limit, the WORKING POOR. You like him so much how about You keep Him there and we be rid of this useless Prime Mistake ! You think most other Canadians can afford a family trip to India, or have one paid by the government? He was elected for his good looks. He takes lots of selfies with the “ordinary” citizens, – but that’s not because he believes in simplicity. He believes in having his picture taken. His simplicity is manifested only in his intellect and his speech. He may behave as an equal to the average citizen in that respect, or worse, and dragging all of us down with his ridiculous identity policies. – The phrases “Canada’s indigenous peoples” or “indigenous peoples of Canada” can no longer be used. It’s “indigenous people in Canada”. – “Mankind” is a bad word. “Peoplekind” is what should be said instead. – Commenting on the results of a criminal case that may yet be appealed. Wholly inappropriate.